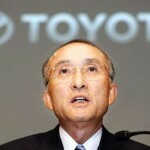 Executives at Toyota Motors, the Japanese automaker, announced today that the company would post its first loss in 70 years, proving that the American auto giants and the overall American economy are wrapped in a global crisis. Toyota is expected to have lost $1.7 billion in its group operating revenue, or the money it brings in from auto operations. The company has not posted a loss since one year after opening, in 1938. In contrast, last year Toyota posted an operating profit of $28 billion. Indeed, the company is now coming down from eight years of record profits. Sinking profits in North America and similar trends in India and China have combined to cause the current losses. Many analysts though that Toyota’s strength in the emerging Indian and Chinese markets might allow it to thrive despite the American economy’s health, but that hope has dimmed. The worst financial crisis since the Great Depression has hit the Japanese car company hard, and is threatening many other companies in Japan, South Korea and Europe, many of which are expected to announce losses in the coming days and weeks as well. Adding to the industry’s gloom, analysts expect the hard times to continue well into 2009. Companies unable to weather the economy for that long may end up being acquired by larger companies.